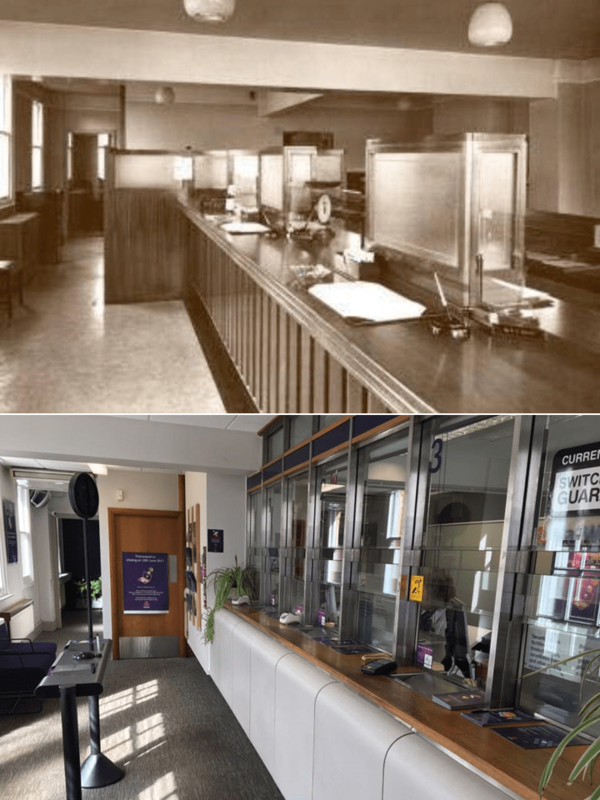 This week’s Then & Now comparison is provided by two local guest contributors who worked in Kenilworth’s NatWest Bank branch before it closed on the 13th of June 2017. 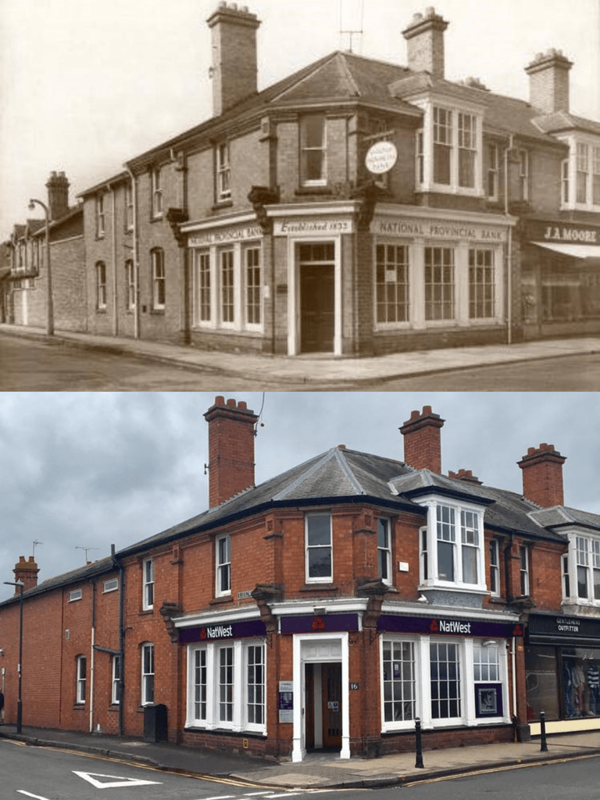 The pictures were kindly supplied by Kally Radcliffe to mark the branch’s closure. The text was provided by another ex-branch employee Mark Francis, taken from a leaflet put together for the branch’s 75th birthday in 2005. We are, as ever, grateful to our contributors for the material supplied. 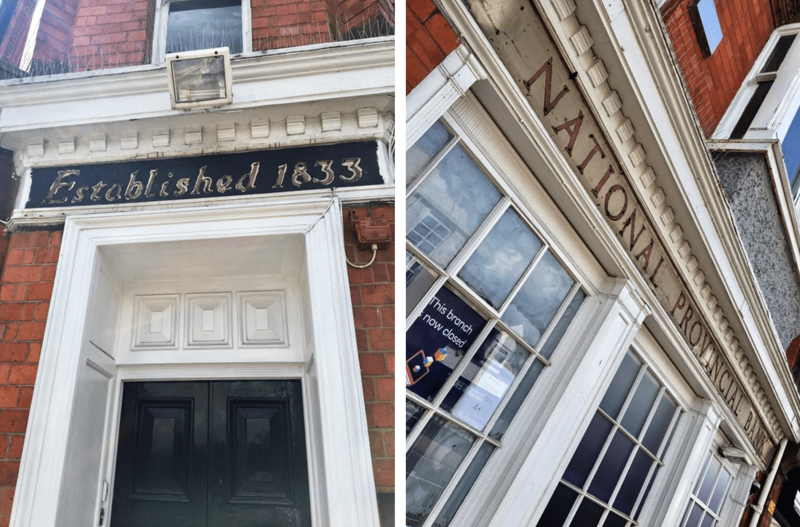 NatWest’s Kenilworth branch first opened as an office of National Provincial Bank in 1930. National Provincial, established almost a century earlier in 1833, had been intent on developing a nationwide branch network from the outset. By the 1920s, with some 700 offices, it had become one of the UK’s ‘Big Five’ high street banks. National Provincial’s new Kenilworth office opened on 2nd October 1930 in premises at 9 Warwick Road as an agency to the bank’s Coventry branch. A sound branch business was quickly established and in June 1931 a lease was taken of premises at 16 Warwick Road. Following alterations costing just over £1,000 the business moved to the new building on 4th March 1932. The outbreak of the Second World War brought such problems as staff shortages and government controls on lending. At the end of the war, in 1945, National Provincial exercised its option to purchase the Kenilworth premises for £2,000. During the 1960s Kenilworth’s railway station was closed as part of the Beeching cuts, though the line remained open for through traffic, and in 1963 nearby Stoneleigh Park became the home of the Royal Agricultural Society of England. The business of the National Provincial branch continued to expand prompting the conversion to banking use of the former manager’s accommodation on the upper floor of the premises. In 1970 National Provincial Bank and Westminster Bank merged to form National Westminster Bank. All of the new bank’s branches – Kenilworth included – began to trade under the name National Westminster Bank. Westminster Bank also had a branch in Kenilworth, in The Square, which had been opened in 1962, and in February 1974 that branch closed and its business was transferred to the former National Provincial Bank branch nearby. The Warwick Road premises were altered and extended along Barrow Road to accommodate the increased business. The range of products and services offered by the bank has increased dramatically in recent decades with the introduction of credit cards, house purchase loans and, more recently, telephone and internet banking.